A rotating platform for holding your camera upon a Foba DSS-ALPHA or DSS-OMEGA camera stand, the Foba "ARBAO" Gear-Driven Tilt Head keeps your heavy camera horizontally level with the ground and allows adjustment of the tilt axis with a secure crank. It is extremely durable and manufactured to be a once-in-a-lifetime necessary purchase for a professional studio. There's nothing to lock or unlock here; the gearing itself is all the security you'll need, no matter what you've got on it. 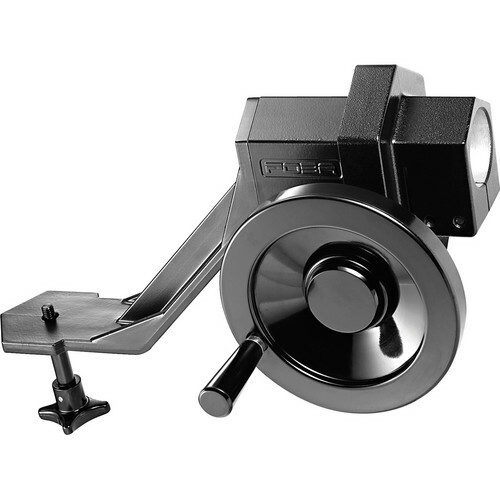 The gear crank handle can be installed on either side of the clamping mechanism, and this head itself can be mounted on either side of a Foba stand arm. There's a calibration for the rotation settings as well. The ARBAO can be used by itself, or combined with a Foba or Sinar single or double pan/tilt head.